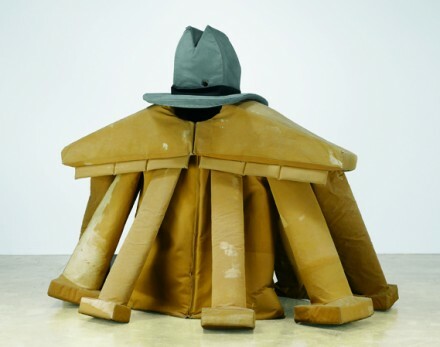 For the first time in seven years, the work of Claes Oldenberg and his wife/collaborator Coosje van Bruggen returns to New York. 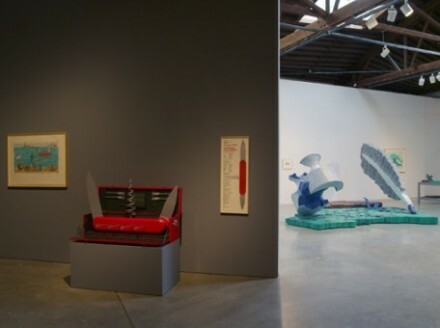 The Pace Gallery’s Theater and Installation 1985-1990: Il Corso del Coltello (The Course of the Knife) and The European Desktop marks the first time in seventeen years that Coltello has been seen in the United States, while The European Desktop will be on display in America for the first time ever. Oldenberg/van Bruggen’s whimsical, elephantine sculptures are the result of a partnership that lasted 32 years, ending only with van Bruggen’s death in 2009. Il Corso del Coltello is a result of combined efforts by Oldenberg/van Bruggen and architect Frank O. Gehry. It was performed just three times in front of a combined 1,500 people in September of 1985. The piece was staged amongst the canals and bridges of Venice, the open air providing the only ceiling high enough to allow Coltello’s massive ornaments to move fluidly on and off stage. 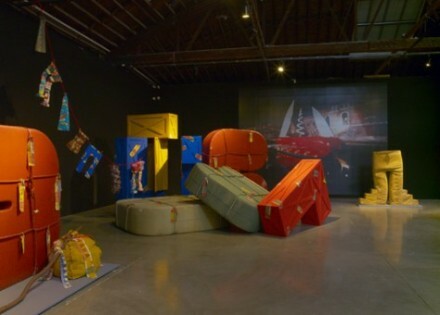 The Pace exhibit includes slideshows of Coltello’s production and staging, with video of the company bouncing the towering luggage of Dr. Coltello over the canals as that same luggage (eight pieces, each cast to spell a letter of “C-O-L-T-E-L-L-O”) stands stacked in the corner of the room. Coltello’s most famous prop, the 78-foot fully functional Knife Ship, appears twice in a smaller, slightly more manageable size. The original Knife Ship is part of the collection at New York’s Solomon R. Guggenheim Museum. This Swiss Army knife turned slave galley personifies Oldenberg/van Bruggen’s ability to underwrite their comic sensibilities with a blunt realism that pits the images of war and slavery alongside their commercial counterparts. The costumes and playful carnival atmosphere of Coltello’s movements simultaneously situate the piece as a part of Italian folklore: the artists invoke both the traditions of commedia dell’arte and the films of Fellini by positioning the supernatural within the real. The props exist in that liminal space between dream and memory that has no solid footing in one world or the other, appearing for an instant before disappearing. 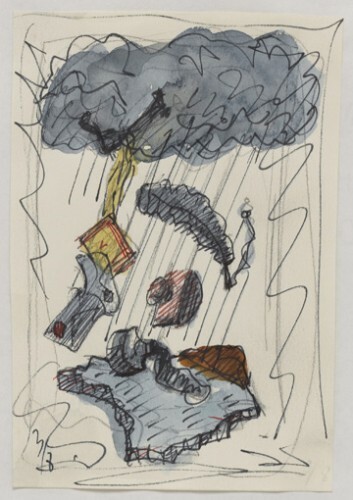 In studies for The European Desktop, Oldenberg had sketched the tools of mid-century commerce (stamp blotters, scales, quills and inkpots) falling to earth as rain from a blackened sky. In the final sculptural product, we have progressed to the moment of impact. The massive aluminum and plaster pieces, strewn about the Pace like hail after the storm, recall Europe’s chaotic history in the second half of the twentieth century. Borders have been redefined, cities destroyed, and truth decidedly written by those left standing. These relics of a war torn Europe signify time’s ability to reconstruct memory as history, and those scattered and forgotten in the process. The studies for both Il Corso del Coltello and The European Desktop are tied by their emphasis on movement, an energy that transfers to the bright primary colors of Coltello and the raw, colossal power of Desktop’s ink pots caught mid-shatter. 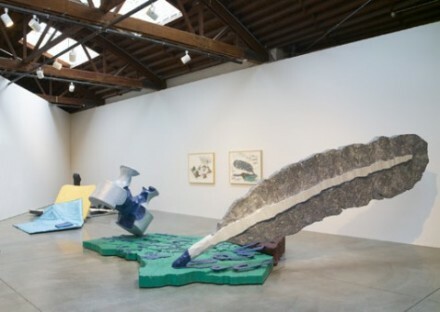 Oldenberg/van Bruggen’s collaborations with Frank Gehry (the tail end of which is represented by Desktop) combine the towering drama of the architect’s scale with the poignant commentary and comedy of two legendary artists. Theater and Installation justly represents its advertised offerings, revisiting forgotten histories and questioning the process behind the categorization of that memory. The exhibit runs through June 23rd. This entry was posted on Wednesday, June 20th, 2012 at 1:07 pm	and is filed under AO On Site. You can follow any responses to this entry through the RSS 2.0 feed. You can leave a response, or trackback from your own site.